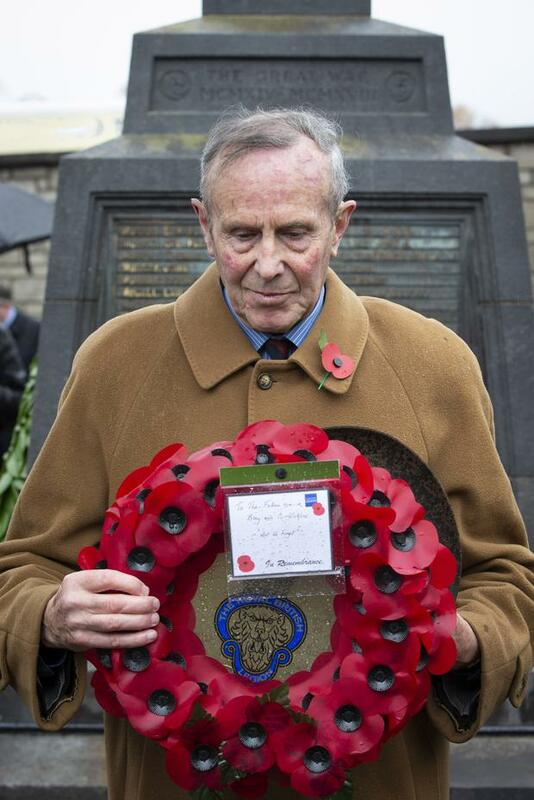 Cllr Pat Vance Cathaoirleach of Wicklow County Council, who laid a wreath at the Armistice day of remembrance in Bray today Picture by Fergal Phillips. From Left: Paddy Corrigan, Des O'Dowd & Cormac Becton from Post 21 Irish UN Veterans association, at the Armistice day of remembrance in Bray Picture by Fergal Phillips. Armistice day of remembrance in Bray Picture by Fergal Phillips. Michael Lee has two grand uncles who served in the war Picture by Fergal Phillips. Family stories of suffering, service, and death in World War One were recalled by those attending a ceremony of remembrance in Bray today marking the centenary of The Armistice. The Celtic Cross war memorial in the town has the names of 155 men who lost their lives in the war. 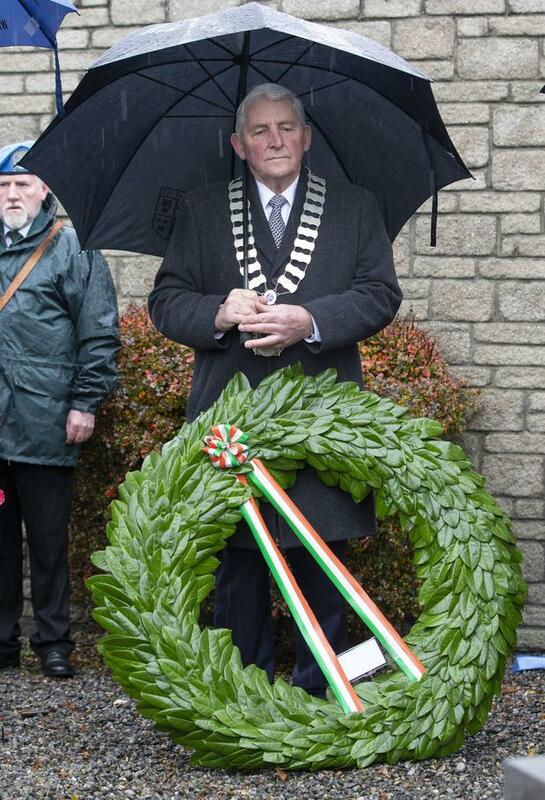 Wreaths were laid at the monument today as singers from Bray Choral Society sang in the pouring rain. Afterwards, some of those who lay tributes told Independent.ie about the loss suffered by their families in the devastating conflict a century ago. Pat Vance, Fianna Fail Cathaoirleach of Wicklow County Council, said his grandfather John Vance and his three brothers left their home in Bray to go to war. “My two granduncles Joseph and William were killed. They all signed up in 1914. One died of injuries that he got in The Somme and the other was gassed and sent home where he died,” said Cllr Vance. “My grandfather John was wounded in fighting in The Dardanelles. He came in on a landing craft and landed on the beach and got hit by shrapnel and was taken back on the same boat. “He was badly injured but he was delighted because he was alive. He recuperated in Egypt, he very seldom talked about it. He came back to Ireland and later lived the rest of his life in England. “He apparently had a terrible time in The Dardanelles and, until the day he died, he hated Churchill because he blamed him as the main man whose idea it was to send them all over there to The Dardanelles. “A fourth brother James came back from the war and went to Canada and we never really heard from him again. Lord Meath, whose family have lived for generations at the local Kilruddery estate, told Independent.ie that his granduncle Ernest Brabazon was killed in the war. “Ernest was aged 31 when he was killed on June 17, 1915, in Flanders. He was a captain in the Coldstream Guards. “My grandfather Reginald was in the Grenadier Guards and he was very lucky. He was very badly wounded. He was the battalion commander and was very badly wounded on November 1, 1914, at Ypres. “He was disabled by his wounds so he went to work in the Munitions Department and then he went back to the Front in February 1918. Within three weeks, he was very badly gassed. But he survived,” said the Earl of Meath. Michael Lee from Glenageary, County Dublin, told Independent.ie: “My great-grandfather was Edward Lee and he was a drapery shop owner in Bray and he had four sons - Edward, Robert Ernest, Joseph Bagnall, and Alfred Tennyson. “Joseph Bagnall Lee was a barrister and he was killed at Suvla Bay, Gallipoli, on August 7, 1915. He was a lieutenant in the Royal Munster Fusiliers, part of the 10th Irish Division. His brother Alfred, a student at Trinity College, was along with him in the same regiment and he was wounded and shipped out. During the ceremony today, local church representatives led prayers amid heavy persistent rain. Among the speakers was Michael Grant and William Lennon of the Western Front Association, Dublin branch, who organised the event. Jim Scannell and Brian White of the Bray Cualann Historical Society also spoke. National and UN flags were borne by an honour guard from the Irish United Nations Veterans Association.